Universities UK are proposing to cut pension schemes for academic staff. The employers want to end guaranteed pension benefits. They say academic workers' final pensions should depend on how their 'investments' perform and not on their contributions. We say it's wrong to risk workers' futures. Why take away the security of a future that can be planned and relied on once academic staff retire? Not only does this affect their financial security and future planning, but also the motivation to work, and even future academics looking for jobs in the education sector could be put off. 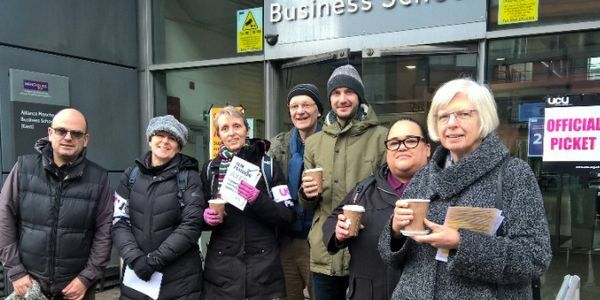 We call on Universities UK to protect university staff pensions and to come together with the University and College Union (UCU) and think of a more viable solution that will not take away a basic need for security. Sign now to email your MP asking them to sign Early Day Motion 619 in support of the rights of academic workers to look forward to a retirement without fear, not having to suffer the stress of financial insecurity. "University and College Union's higher education committee says serious and sustained industrial action is required in the face of damaging proposals from the employers which would effectively destroy the USS pension scheme." "That this House recognises that academic staff in universities make a vital contribution to ensuring the supply of skilled graduates to UK businesses; believes all staff working in universities should have access to a secure and decent pension; notes with concern the proposal by Universities UK to close the defined benefit portion of the Universities Superannuation Scheme (USS) to all future service; further believes this would significantly reduce the security of retirement income for academic staff in many UK universities, making careers in those institutions less attractive; and calls on the Government to review the current situation and urge Universities UK to work with University and College Union to find a better solution which ensures that USS remains competitive compared with pensions offered to other education staff and those in other professional occupations." If you have already signed it, thank you very much, I really appreciate it. If you have not yet signed it and are unwilling to do so, please respond to let me know your reasons.